Writing, Surviving & Thriving: All day workin' . . . .
Just wanted to check in and say hello from my desk! This week has been CRAZY!!! From numerous orientations, to finding my way around campus, it's been a super busy week, but I'm slowly figuring it all out. I have to pinch myself just to make sure this is all really happening. More on the new gig later; I just wanted to check in! I survived the first week and lived to tell the story! Until next time . 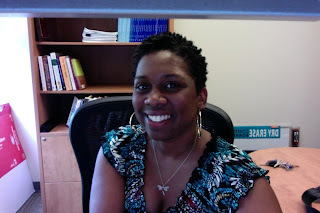 . . Dr. TJ will be over here getting ready for her new students!